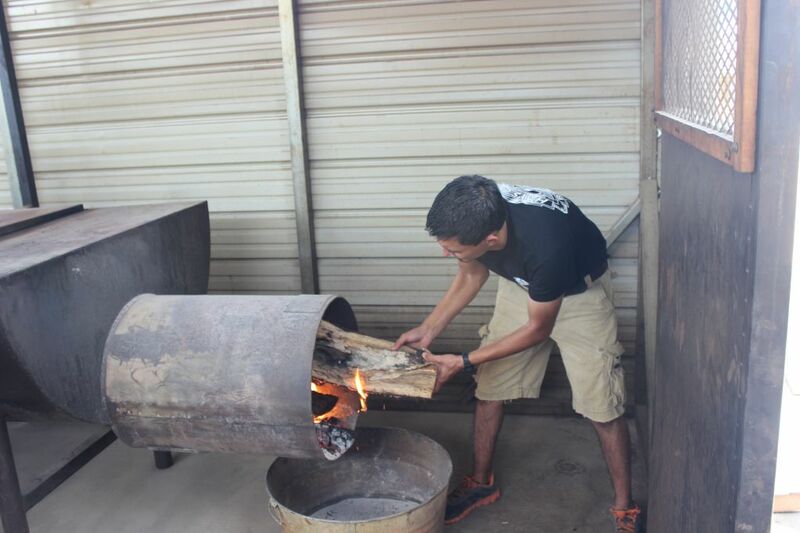 In this series we will look at the next generation of pit masters; those under the age of 30. 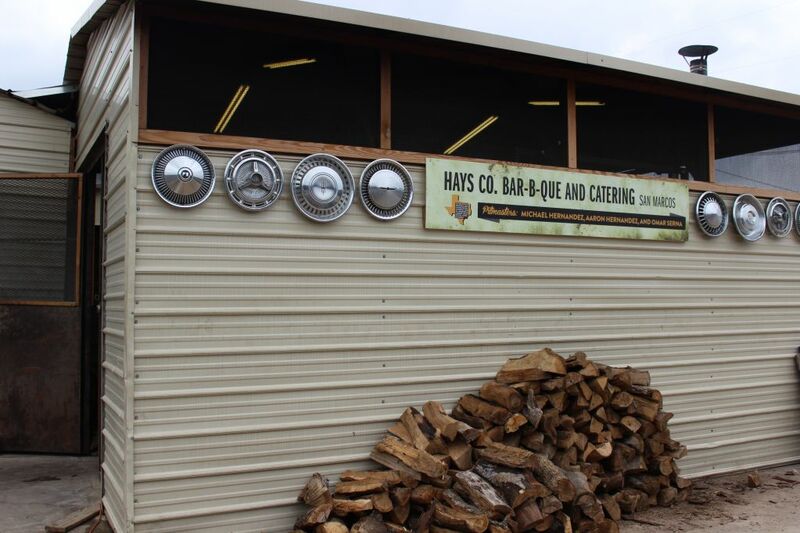 For this first article, Hay’s Co. Bar-B-Que in San Marcos, Texas is featured. 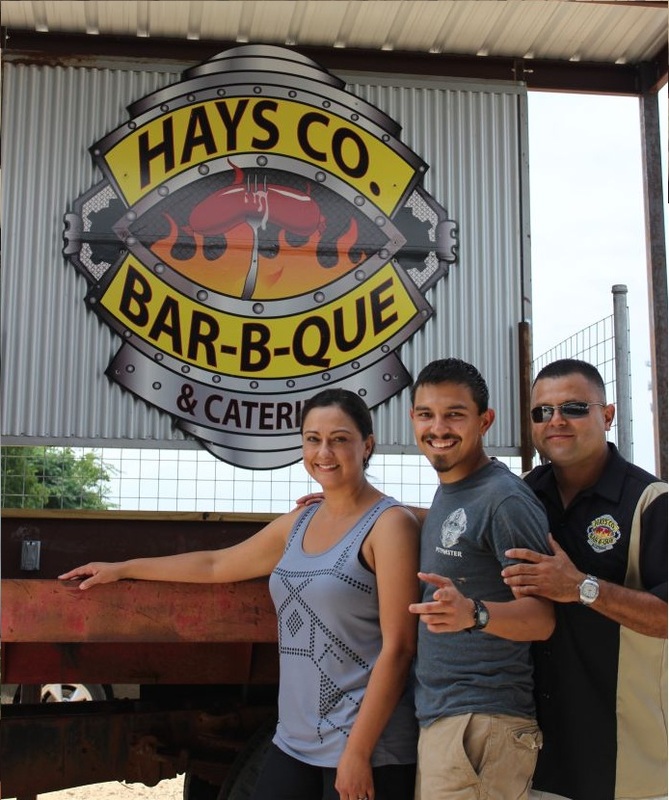 In 2007 Michael and Asenette Hernandez purchased Hays Co Bar-B-Que and ran it from the location on Hunter road in San Marcos. Not long after making Texas Monthly’s famous Top 50 list, they ran into an issue with the landowner. In December of 2013 the business was moved to its current location on the west side of IH-35 just south of the San Marcos River, where a used car lot was formerly located. The barbecue is great here, and behind the dining room lays an experience unto itself. A Pavilion was erected on a concrete base with room for hundreds among ample picnic tables. These face a bandstand made upon an old flatbed truck where live music is played on weekend nights. 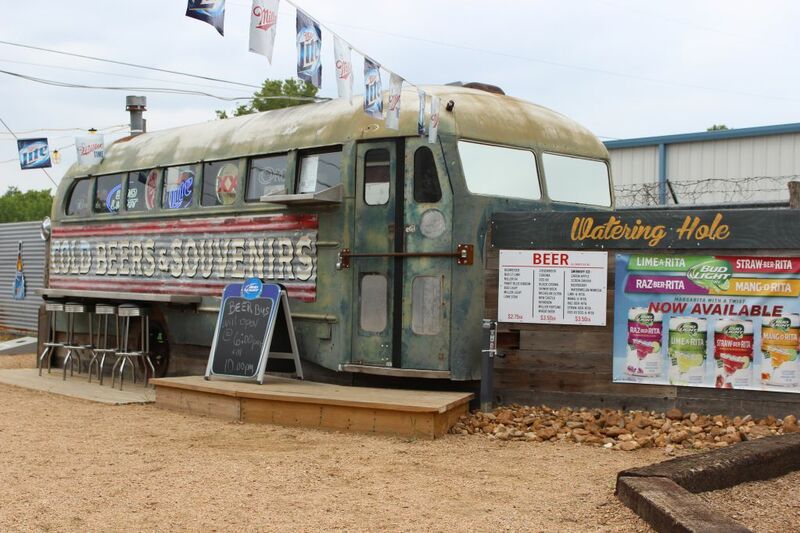 Off to the right there is a child’s playground and farther down is a 1947 aluminum bus converted into a beer bar. Barbecue is served into the evening and the bands play until 10pm on the weekend. 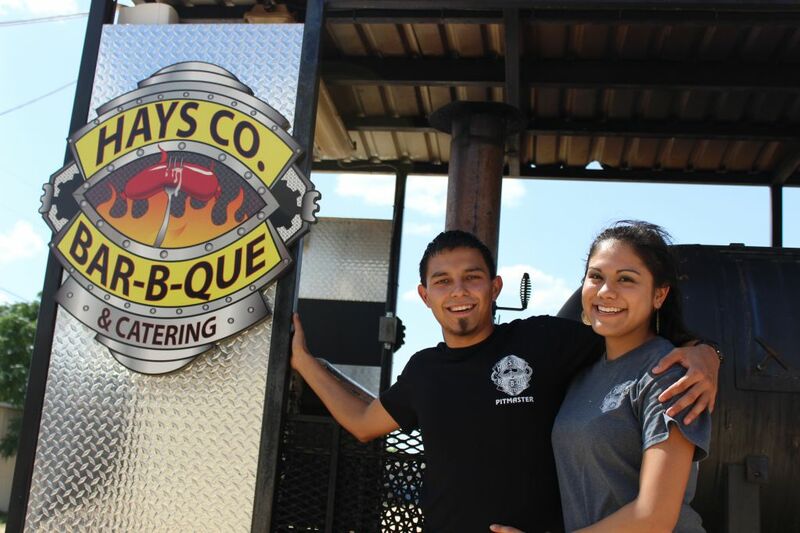 Hays County is a family business, with Michael and Asenette Hernandez at the helm. 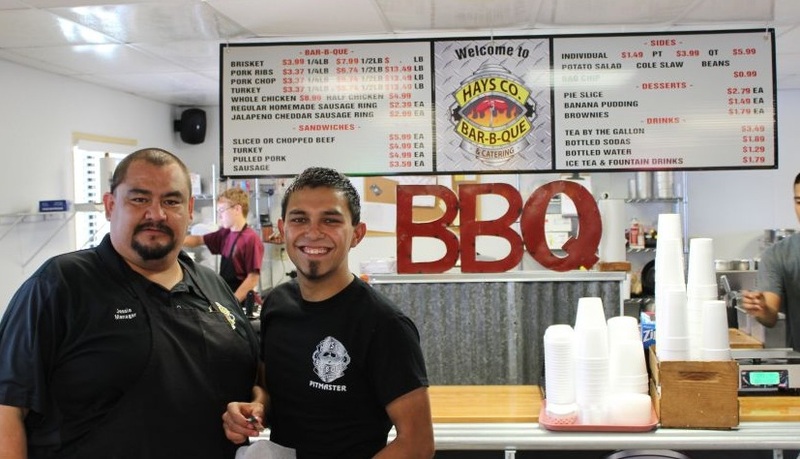 They feature quite possibly the youngest pit master in Texas with son Aaron who began working the pits at age 15 and handles multiple roles at his current 20. With maturity well over his age and a well displayed passion for barbecue I interviewed Aaron and father Michael for the Young Guns series. Bryan: When did you start working in barbecue? Aaron Hernandez: I’ve been working here since age 14. Bryan: What was your first job here? run the cutting board before then. That day he was like “you need to get off the board because we’re busy and you’re gonna hold up the line”. He wasn’t being a jerk but he wanted to make sure everyone got served. I looked at him and said, “Dad, I got it”. I just started cutting and was like “yes sir, what can I get for ya”; just started going at it. After that he kind of stood back and said “OK, you got it, kid”. After that I started moving my way up. At nights, he’d go home and leave me at the pits but back then it was slower and I was mainly just cooking the sausage. He taught me what to do with the fire, how to make it hotter or colder, just the basics. Once I turned 15 I started to get a little more experience. During my senior year I was a little more focused on the restaurant. Bryan: So working at a barbecue restaurant must have its advantages. Did you get to bring barbecue for school lunch? Aaron Hernandez: Oh yeah, once I got my driver’s license I was at the restaurant every single day. During lunch I’d sneak off campus and get some barbecue. Back at school they’d kind of huddle around me and say “oh wow, where did you get this.” I could say it was from our restaurant, and that my dad cooked it. Ever since I was little I always promoted our restaurant. Once I graduated I started to do it full time. One year I just did it from 6am-3pm, 6 days a week. I got a little tired of it after seven months straight. It was tough; I’d be with my friends at 8pm and I’d tell them I have to go to bed. Working with your parents, then going home with them was getting a little much. I told my dad “I need a break from this. I need to try something else.” I worked for a security company for about 4 months, just to do something different. My dad was always on me to come back. After a while I realized that I miss the barbecue. I came back and the first day I came back, my food was on point that day. I realized it’s what I’m meant to do. Before then I had always wanted to be in the pits but they were worried, saying “the smoke’s going to get to you; you’re going to get lung cancer” but it was what I wanted to do. Bryan: You guys don’t run thermometers on your pits. Was it difficult to learn how to run the pits without them? Aaron Hernandez: You know, it sounds a lot more difficult than it is, but I guess it’s because I never learned with a thermometer. We do use thermometers to temp out the turkey, chicken, and pork chops. Other than that it’s pretty straight forward from what my dad has taught me. If you open up the lids and it’s too hot and the food’s sizzling then you’re cooking too hot. I’ve had my share of screw-ups throughout the years. I’ve burnt a few briskets and a few chickens when learning. It happens, especially if you have to go help in the restaurant and forget. I’ve learned though. Bryan: Working with the weather - the temperatures and humidity can be a challenge. How have you coped? Aaron Hernandez: It’s a huge challenge for me. My kryptonite is rainy days. I’ve started to get a lot better at that, as time progresses I’ve learned something new every day. I’ve learned the sausage recipe. We use Boston pork butts and certified Angus brisket in there, all made by hand. There’s nothing in this restaurant I can’t do now. Bryan: There are five acres behind the restaurant and Hays County has added the pavilion, children’s playground, beer bus, and games. barbecue is served into the evening and you guys are hosting live bands out there. What has that been like? Aaron Hernandez: We had the band Wyzer out here July 25th; that was outrageous. I was running in and out all night. It was insane. Today I’m feeling it, like I got beat down in a bad fight. Bryan: What’s a normal weekend like? Aaron Hernandez: On a weekend I’ll get here at 3pm and get synced with Omar. He kind of runs me through everything. I get a count on everything. I’ll start planning for the evening. I know turkey takes 3 hours; chickens take 2 and half to three hours, same thing with ribs. I start going through my time frames and decide when I need to start putting food on so it stays fresh. We crank out fresh food into the night. I put on the meats and around six I put on our second batch of food. By then I head back into the kitchen and help out. Last night I also had to play traffic director, we had the entire back area full of cars. My dad has a million other things to do so I try to help out where I can. Bryan: Unlike some places that only have a lunch crowd, you have multiple rushes. 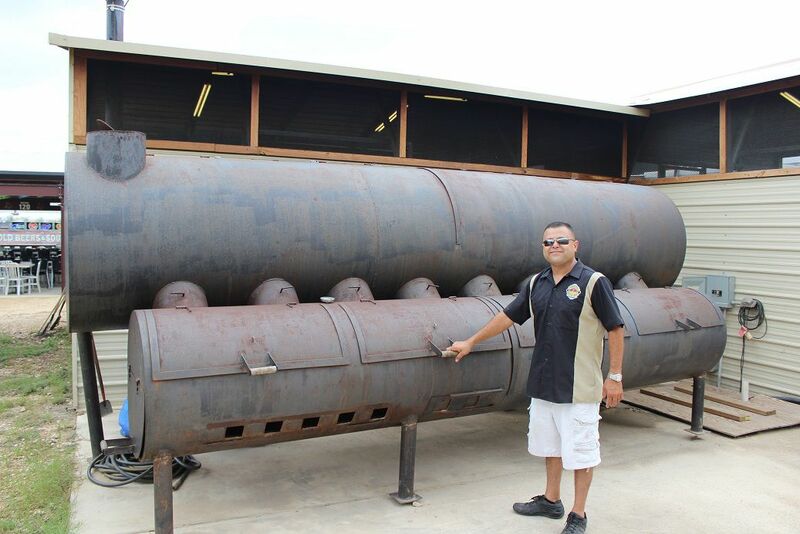 You guys are building “El Chingon” which may be able to handle a hundred briskets at once and that should help, but is it hard to keep the food going without running out today? Aaron Hernandez: By the time our lunch rush is over, around 1:30 or 2 we start getting ready for our second rush which is from 5 to about 7. Keeping the pits working is ongoing throughout the whole day. Sometimes around 3 o’clock we do run out of room on our pits. Being a pit master there are a lot of things to deal with. You’re messing with your temperature, the fire, making sure the food is coming out on time and with high quality. I have to play Tetris on the pit all the time. There is one pit which is my favorite. We brought it over from the old restaurant. There are certain things you can’t do on that pit. For example, you can’t have the ribs at the very back and block the smokestack. It’ll slow down the cooking time. will help. We’ve had times where our current pits are full and people are still coming in. That’s when we start using our pit on wheels to help out. El Chingon will be up before the end of August. We’re going to have a T-shirt made with it on the back. Bryan: Growing up, when did you really first get a taste for barbecue? Aaron Hernandez: Back when we lived in New Braunfels, we used to eat Rudy’s. I used to make lean brisket sandwiches with pickles and creamed corn on top. Aaron Hernandez: Yeah. Once my parents bought this place I started eating barbecue every day; breakfast, lunch, and dinner. I like fatty now. Bryan: Have you been to any of the other big Texas barbecue joints? Aaron Hernandez: Yes, we’ve been to Snow’s in Lexington, la Barbecue, the three in Lockhart. Everyone has their favorites. Overall it was a pretty good experience. For me, it opens my eyes but I feel confident in our product. Bryan: There is a famous barbecue restaurant expanding to San Marcos. Michael Hernandez: We’re in the same type of business, and we’re both family owned. I think there is a difference in barbecue; they do what they do. I think it will draw some attention to this area. I think there is more than enough to go around. It’s a great opportunity for us to sharpen what we do, not that we haven’t been doing it, but it gives us a reason to keep our current base and not give anyone a reason to go elsewhere. Bryan: I think it could make this a new hot spot. Lockhart was never about one single restaurant but rather the collective. Michael Hernandez: Absolutely. I don’t think it’s a bad thing. It will give us an opportunity to continue delivering what we’ve always stood for and stay on top of our game. I know they have a lot of history but we have a lot to offer to San Marcos. We’ve been doing this for seven years and have been doing a lot locally, Texas State, City, the fire department, the DPS and the major corporations around here. Bryan: December of 2013 you had to move due to some issue with the old landowner. Was that difficult? Aaron Hernandez: Surprisingly it was very quick and behind the scenes. It was from one day to the next. We closed there on Friday at the Hunter location and opened here on Saturday. People were still a little confused but it wasn’t too bad. It was as smooth as it could go but I still have people coming in here and saying they didn’t know we moved. Bryan: With the large lot behind the dining room you have added the pavilion, the bandstand, and the beer bus. What do you see in the future, like five years from now? Aaron Hernandez: From what I see, from the numbers we’re doing now, I don’t think this little building (the dining room) is going to cut it, especially right now when we run into some issue with seating inside, and the heat outside. I don’t want to hear anyone complain about the Texas heat. Eventually we might have to tear this building down and go with a bigger one, maybe something like a 500 person seating area. I see a bigger pit area, like 8 more pits. One thing I always like is something like Kreuz, how they have their whole pit room. It’s just amazing to me. Their pit area is awesome. Maybe an air conditioned prep room. Overall I see huge things happening. Michael Hernandez: We might have a pavilion for celebrating private parties, a putt-putt station, I don’t know. Where is this journey going to take us? I’d say that it’s just going to continue to grow. As we continue to grow I think we’ll become a hot spot and a destination. It’s happening now, but in a healthy way. Growth is excellent but you don’t want to outgrow yourself, you want to grow with it. That’s how we’ve been able to be successful. If it grows, we adjust, we grow with it. Bryan: Live music and barbecue go together. Last night sounded like you guys did well, how did that work out? Michael Hernandez: That’s another entity that’s taking off for us, it adds value. I’m a big barbecue fan obviously. I love beer, and I love live music. To me, you get those three together and it’s that feel of family, friends, and barbecue. Based on what I saw last night it’s a confirmation of us delivering that experience. It’s a great feeling to look out here and see the kids play scape being utilized, seeing families laughing, standing up, jamming out, chewing on a rib, drinking cold beer, and dancing. It was really rewarding to see our hard work come to manifest. As I look across the board and other guys are doing stuff across the state of Texas I see an increase in others doing that, too. As far as the size of the venue we have we’re going to take it to the next level. Bryan: Last night was also no cover? Michael Hernandez: No cover. When we start getting major headliners, at that point, there might be the bare minimum. But by that time we are thinking of maybe having an amphitheater back there. Bryan: Have you had any music festivals here? Michael Hernandez: Yes, on July 4th we had an event we did for the first time and could be an annual thing, probably on a Saturday. We had back to back bands from when we opened until we closed; six bands. Next 4th of July we’ll have security, a parking assistant, and more. It’ll be great. Bryan: Have you had any conflicts working together? other’s nerves but at the end of the day we look at each other, smile, and we start laughing. It’s been a hell of ride here. Bryan: Anything else you’d like to speak to? Michael Hernandez: Our tag line is “Preserving Central Texas Tradition”. To reinforce that I’m not only training my son but we have the other tenured pit master (Omar) and we have a young gentlemen by the name of Zach who’s coming up pretty quickly. If something were to happen to me tomorrow I want the tradition to continue. I take that to heart. I think we, as all central Texas barbecue restaurants, own that. 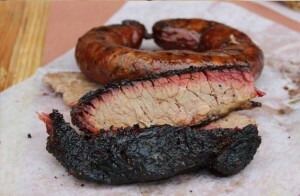 You don’t go to New York City and see “North Carolina Barbecue”, you see “Texas Style Barbecue”. Along with that comes the pursuit of perfection. I try to instill that on Aaron; don’t ever stop pursuing perfection. Every day is a challenge. I’m a perfectionist, he knows it. MH: I want the very best at 11 o’clock in the morning. I want the very best at 8:59 at night. I want the perfection: the food, the cleanliness, the customer service. Consistency and quality are what we stand on. That’s why the title of pit master is not taken lightly. Tags: Hay's County, Hays, Hays Co.